Need bottled ink or refills? "Got the pens yesterday. Awesome, is all I can say! They are fine tuned, better than I could imagine, and write as smooth as China silk! Many Thanks!!" "Dear Sir, I have received my Dragon Pearl pen from you and it writes extremely well. Thank you for the fine tuning." "I'm very pleased with the Uranus LEFL that I recently purchased from you. The nib is among the smoothest that I own and that includes my Sailor 1911 XF. The pen writes very well. You do a great job with your pre-shipping nib adjustments and both of the pens [Jinhao Dragon Pearl Silver] I've gotten from you are among my best writers. You do great work, have an excellent product line, wonderful prices, and your business should be better known." "I have been writing with this pen for a few days now. I purchased this pen to use as a functional "desk decoration." It writes extremely well; very smooth nib, nice ink flow, moderately fine line. Its a bit heavy in the hand, and the very high relief of the design is not very hard on the hand. Writing with it is much more comfortable than I initially expected. The workmanship seems to be excellent. The nib is visually stunning. 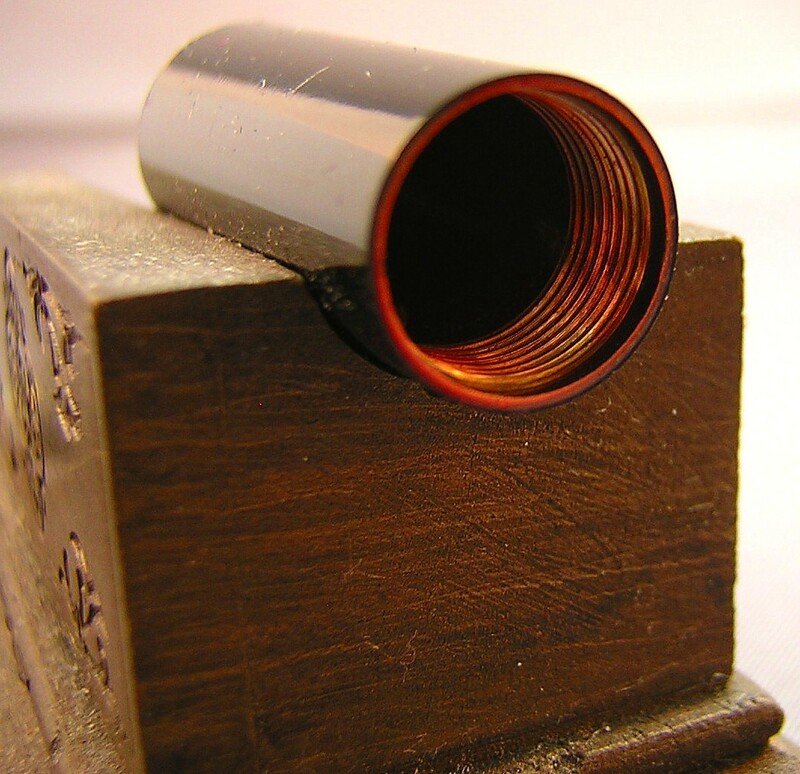 The high relief design of the barrel is well-done. 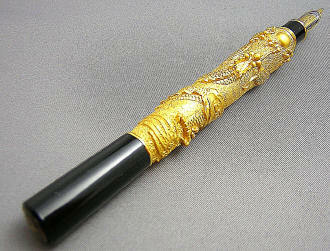 This is a fine pen. I am impressed with it. Not to be carried around in ones pocket, but great on the desk." "Hi Norman, just a jot to let you know that my Dragon Pearl (in Ash) arrived today, in excellent condition and faster than I expected ! I have already rinsed out the converter, inked up (with my personal favorite, Chesterfield Mahogany) and wrote a few lines to check it out. The pen is extremely comfortable, well balanced (even with the cap held aside), and smooth as silk, thanks to your "fine tuning" prior to shipping. Expect to see more of my fountain pen orders in the future." "Dear Norman: I received the pens yesterday! they look excellent! As you kindly said, they conform a beautiful collection all together. I dive at once on the whole bunch, touching, feeling and looking closely at every detail and characteristics of every pen. Let me remark, from the beginning, the severe beauty of the Stealth, the baroque brilliancy of the Jinhao and the comfort of the Seven Horses. Thank you very much for all, you were of great help and everything went so smooth. We will surely keep in contact. Best Regards from Spain!" 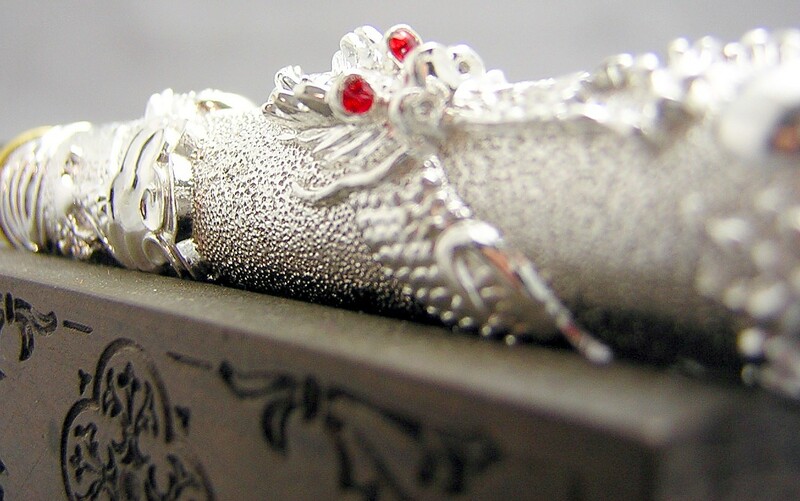 Often called the Dragon's Precious Pearl or Stone, the mythological connection between the dragon and the precious pearl apparently goes back millennia. 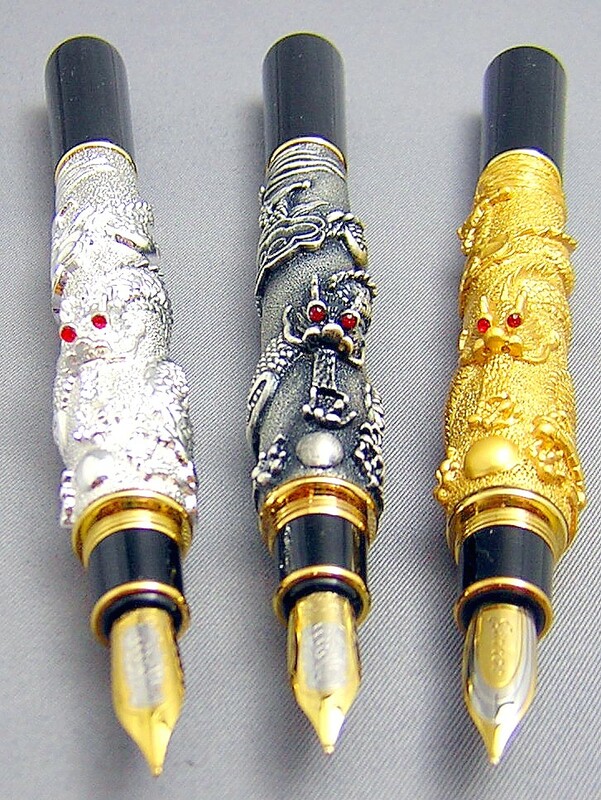 The myth usually portrays the dragon as protecting the pearl, partially symbolized on these pens with the dragon's eyes seemingly transfixed by it. Measuring 5" capped, 5-1/4" posted and 5" with cap held aside, these hefty metal pens are clipless. So, unless the pen is left as your desk pen, you'll want to transport the pen in a secure, enclosed pocket, case or pen roll. 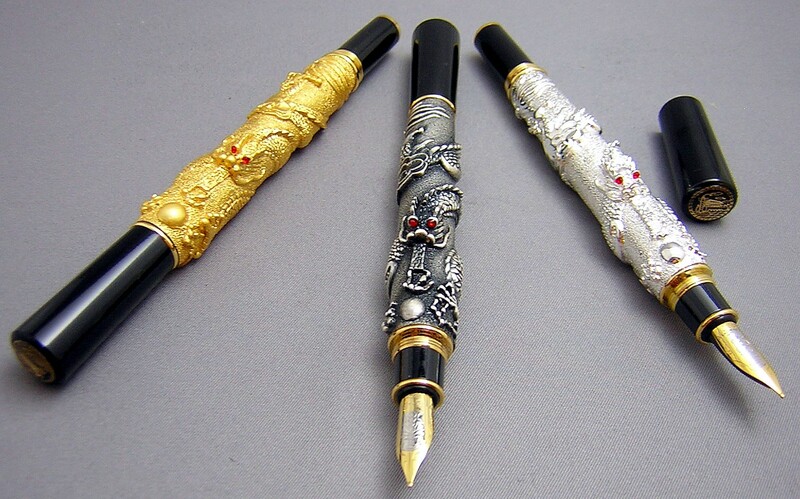 At first blush the high-relief dragon, which wraps sinuously around the pen's barrel, would seem to preclude a comfortable grip when writing with the pen. I've never found that to be the case. I've used these pens for hours at a time, and my hand seems to always fall naturally into a very comfortable position. In fact, the raised metalwork actually provides me with a very secure purchase upon the writing instrument (my thumb tends to nestle against the side of the dragon's head). 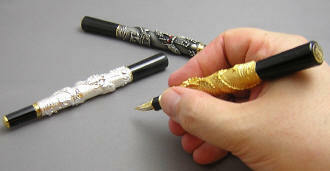 With a shape reminiscent of the Duke Columbus (sadly out-of-stock for some time), this model also has a cap that posts on both ends of the pen. Speaking of the cap, the representation on its top depicts the Tian'anmen Gate of Heavenly Peace, which was the principle entrance to the Forbidden City during the Ming and Qing dynasties, as well as one of the huabiao, which is one of a pair of10-meter-high white marble columns that stand before the entrance (you can read more about those by following the link above). The cap threads are metal -- some brass and some copper -- as is the whole interior of the cap itself. This makes for an excellent mating of cap to pen...whichever end is used. 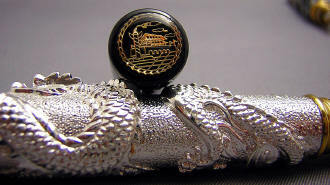 Although my personal pen came with the regular Jinhao engraving on the nib, my most recent order sports the dragon's head version. 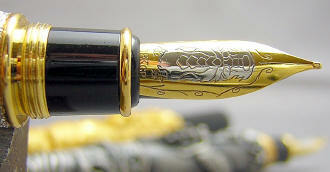 The nib itself is two-toned and also displays the Chinese characters for Jinhao and 18K GP (gold-plated). I would rate the nibs as a light-medium, meaning it lays down a line somewhere between a typical western fine and medium nib. Smooth, and not as stiff a nib as those found on many Chinese pens. Unscrewing the section from the barrel, one finds the included piston converter for bottled ink. Interestingly, the recent ones I've received use copper for the metal parts (I can't guarantee this for every shipment though), like that found in the Dragon Offspring pens. It will also take International-style cartridges, such as those from Private Reserve. As with all new pens, I recommend to run a dilute solution of dishwashing soap (two or three drops to a small bowl of water) through a new pen a few times, followed by water only. Step one is effective at removing manufacturing oils that can tend to make the ink less than enthusiastic in heading from the converter/filler to the nib, and step two removes the traces of the detergent you've used...which tends to have the opposite, diuretic effect. A gift box is included. 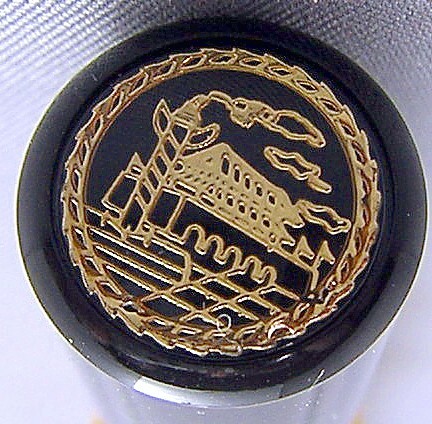 IMPORTANT SERVICE NOTE: Every nib that ships from His Nibs is closely examined under high magnification and tuned or adjusted if needed. 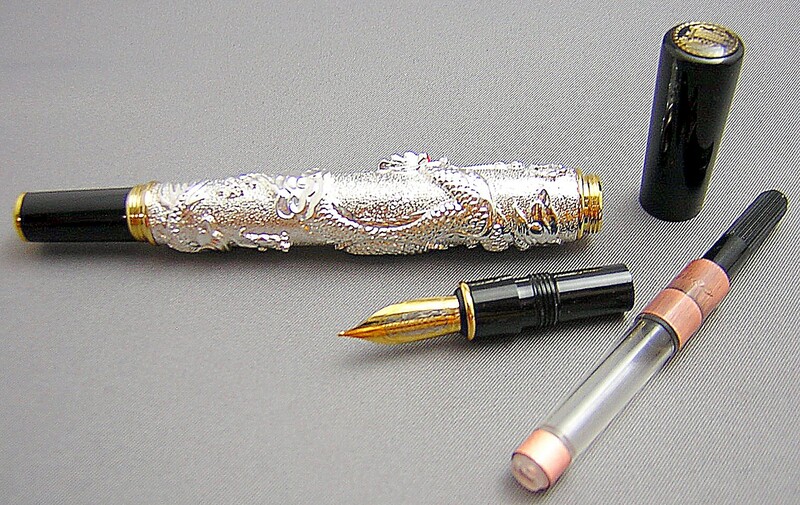 About 85% of modern nibs need some adjustment out-of-the-box from the manufacturer for an optimal writing experience. Most commonly, the tines of the nib are misaligned -- which would cause scratchiness at the minimum; the slit between the tines is partially or fully closed -- which would starve the nib of ink and at best cause skipping; or the slit between the tines is too wide -- which will either again cause skipping, or conversely, flooding. 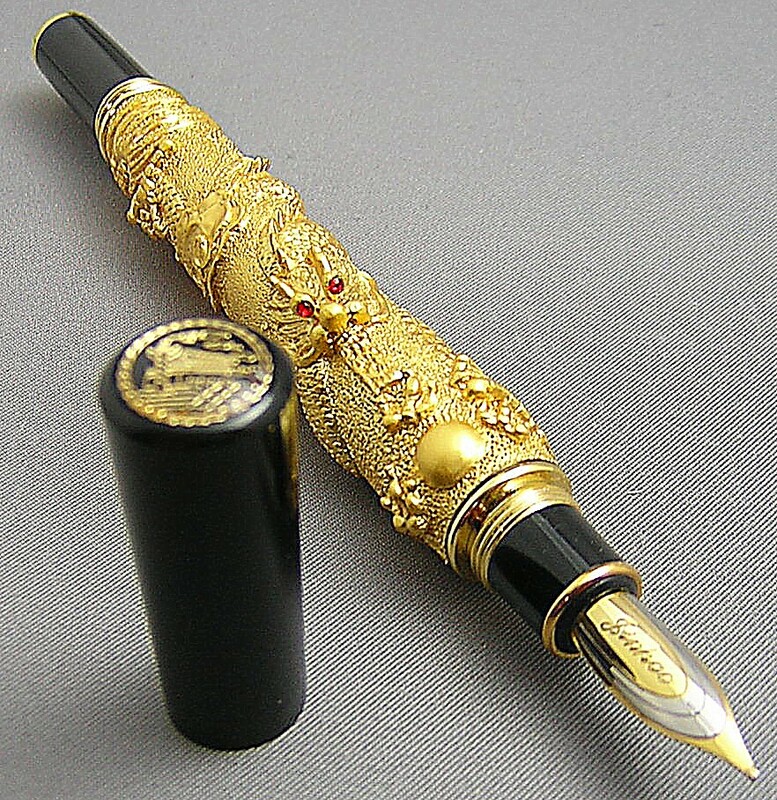 There are other factors -- such as separation of the nib from the feed -- that are inspected and repaired before any pen leaves the Palace. 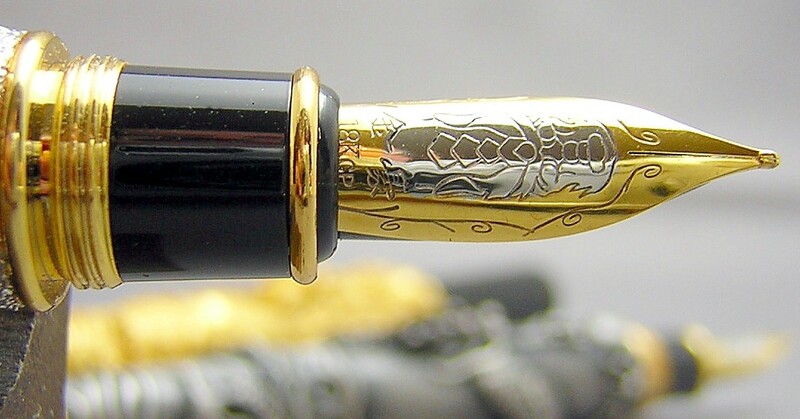 The only 100% guarantee of course comes when the pen is actually filled with ink and written with for the first time, but our pre-shipping inspections and tunings have eliminated 99.99999 (my finger is getting tired) of the frustrations that a customer experiences when first using a new fountain pen. Although this can be time-consuming on occasion, it affords our customers a much more pleasant experience when receiving a fountain pen from His Nibs -- and saves us the frustration of dealing with returns!